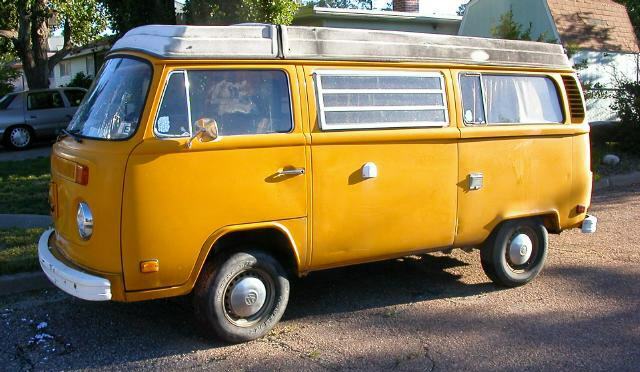 This bus was sold to a happy new owner in Phoenix who wanted a retirement project. A 3.5 MB zip file of detailed photographs is available here: Cassandra_Mar2009.zip. Since those photos, the door handles have been fixed and the door panels reinstalled. Body has very little serious rust, limited to the battery tray and the rear right fender. Key parts, including rocker panels wheel wells, jack points, front end, and crossmembers are fine. Nose is crunched by tire, and shows some previous body work. Engine is not currently running. Suspect minor maintenance needed. Until the engine is running, the brakes and transmission have not been evaluated. Same with speedometer, gas gauge, etc. All curtains are present, including the rear mosquito netting. Main sink cabinet is missing. Rear bumper bent, front bumper is fine. Front seats could use rebuilding. Dash pad has multiple cracks. Poptop mechanism works fine, though canvas is torn. The tires hold air, but are the wrong size and/or rating. Both front door handles and seals replaced. Driver's lock cylinder replaced—all locks now work on original key. Cylinder and additonal key made to code by Gabriel Garcia's shop. Slider door now closes well; nylon spacer replaced. First layer of cleaning is done. Get the engine running. It turns over and often idles, but dies if any gas is applied. this is typical of a vacuum leak. Valve asjutment, tune-up, and vacuum system refurb is planned. Parts are on order. New tires needed, including spare. Rebuild and reupholster front seats. Install sink cabinet or bench or something. Rear curtains need lower rail.